A Social Art Project with a floating membership of practitioners, with a critical interest in the ways in which we understand space and place, questions of power and subjectivity. SpiritStore is an ongoing art project. It has evolved practicing within a broad cultural framework, articulated through a number of collaborative, participatory, and interventionist methods. The project operates in conjunction with groups, from cultural practitioners and institutes, to business owners and organisations, and invites audiences and collaborators to engage in specific meaningful ways. To date projects include, the SpiritStore Art Café at the Sarsfield Bar 2009, Packet and Tripe at ev+a 2010 SpiritStore CATDIG at ev+a 2010 and the SpiritStore Poetry Depot in collaboration with Inkstorm 2010-12. 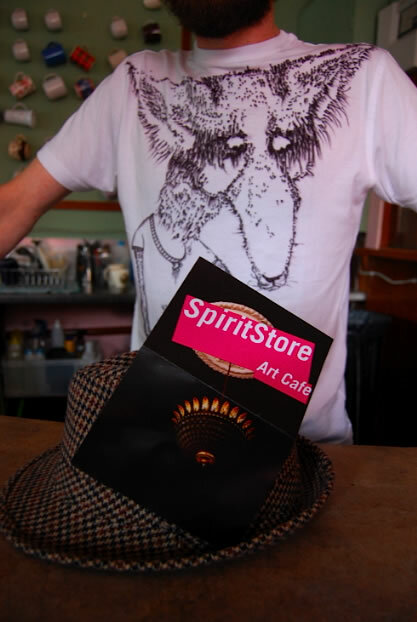 The SpiritStore Art Cafe project was initiated in The Sarsfield Bar, in 2009. Over the course of several months, this well known bar, housed in Limericks oldest Georgian building, was reopened and instated as the SpiritStore Art Café by a team of particpants. This particular bar had been closed to the public for five years; however it held great, almost mythical status in the collective Limerick imagination. This was due entirely to the reputation of the original owner, Sean Hickey. SpiritStore established the main bar-room as a social space/café open daily serving free tea and coffee with a weekly programme of workshops, readings, performances, exhibitions, talks and installations. The project was carried out to two distinct phases, a Negotiation and Renovation phase and the Social/Public phase. In the first phase we deployed a labour share methodology. This was defined by the cooperative exchange of our labour pulled together as hands on skills, crafting, building, designing and imagining a space that both assimilated the Sarsfield Bar and accommodated our project goals. Through these experiences we developed project intentions collaboratively shoulder to shoulder. Simultaneously we performed the negotiations on the right to use the space with various authorities. Through this process we enjoyed the current owner of the building becoming an active participant in the project. In the Social/Public phase SpiritStore provided structures to catalyze social exchange crossing public, professional and social spheres. Our preservation and attitude to the heritage of the space served to engage a broader Limerick audience. We provided alternative spaces for audience interaction and used an inclusive and open-ended curatorial practice which included performances, public talks and meetings on subjects as diverse as Mathematics, Museology, Architecture, Graffiti, Perceptual Psychology, Archaeology, Poetry, Music Composition, New Music, Active Social Spaces, Slack Spaces, Skateboarding, Literature, Artists Collectives, Interaction Design, Choreography, Film Discourse, Script Writing, Games Design, Visual Art, Astronomy, History, Cinema and more. In 2010 Curator Elizabeth Hatz invited SpiritStore to mark the opening of the International Visual Arts Exhibition ev+a , Limerick city. In collaboration with Teaspach Theatre Company we served the traditional Limerick meat dish, Packet and Tripe’, in a temporary exhibition space situated on Catherine Street, a city street with a history of food production. Here we played with the familiar as exchange – Employing the conventions of domestic, ritualized, convivial, traditional food production and consumption as the intersection of art, labor, economics, and the production of social experiences. The surrounds of Catherine Street was historically called Pigtown, meat production, distribution and its economic impact on Limerick working families was integral to the social history of Limerick city centre. 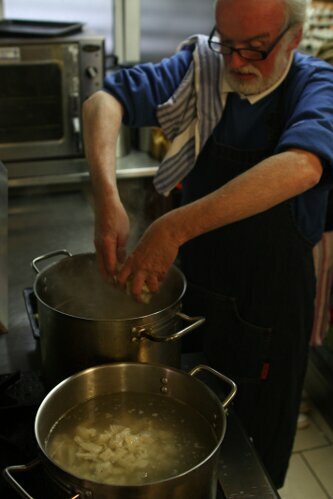 Packet and Tripe, a unique Limerick recipe was reproduced for public consumption drawing dialogue on the methods, the collective memory of and social impact of meat production. Our research and production was in consultation with Limerick families who had lived or worked on Catherine street and the senior ladies of inner city St Mary parish, who sold, bought and cooked the Packet and Tripe..see more on dedicated webpage. 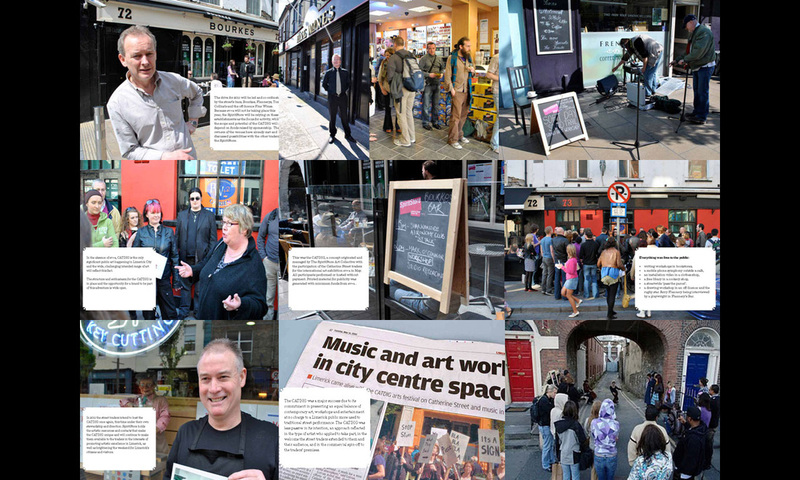 Our second larger contribution to ev+a 2010 was ‘Catherine Street Cultural Dig’ (CATDIG) Residents and traders from Catherine Street in Limerick city centre participated with SpiritStore acting as hosts of a full weekend programme of cultural events curated by SpiritStore. This project was deployed in three phases; the research phase; a collaborative ‘event organisation’ phase; and an implementation phase. recording. Later, our project team coordinated the event programme, PR, volunteer coordination, equipment and physical preparation etc. The programme ran as a weekend event with over 60 cultural workshops, performances, exhibitions, talks and installations. The inspiriation for the SpiritStore Poetry Depot first came from a feature on Public Radio International (http://www.pri.org/) on the Miami Poetry Collective who had taken to the street with their typewriters to write poems on demand. (http://miamipoetrycollective.com/ SpiritStore and Inkstorm first came together in summer 2010 when SpiritStore approached Dave Rock, InkStorm poet, to discuss the possibilities of running a similar event here in Ireland, with some alterations and additions to suit the context we're working in. We began under an agreement to work together to develop a collaborative poetry writing method. The goal of the SpiritStore/InkStorm Poetry Depot is to engage skilled poets and a new audience in a shared/joint experience of writing. Together SpiritStore and Inkstorm have worked through a series of workshops and Poetry Depot events which help to mould our collaborative methods. Our schedule began with a small experimental Poetry Depot on Culture Night, Limerick 2010 and has evolved as the project continues. Over the interations of the Poetry Depot, the experience and its evaluation have changed the language that is used to deliver the concept. We are conscious that the practice of sustained creative writing must not be diminished by the method. We are therefore careful to point out that the poems produced at Poetry Depot are first drafts of a poem. For the majority of writers this draft merely begins a period of reflection and creativity which may produce a finished poem. 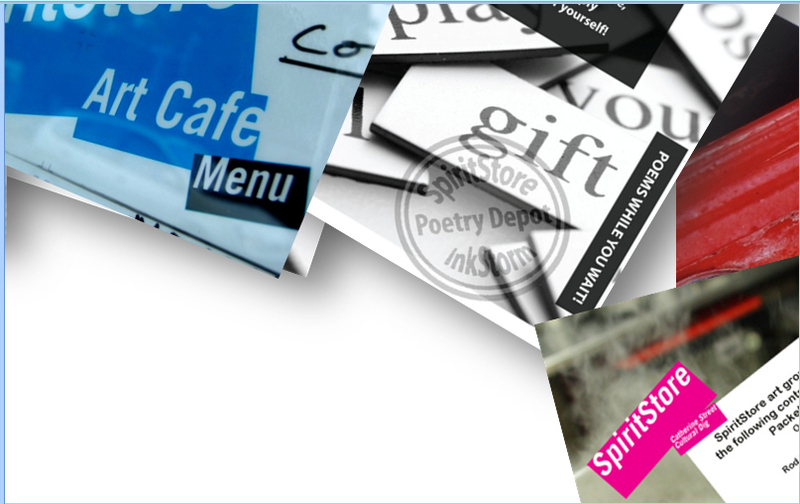 In spring 2012 SpiritStore held its final consultation with InkStorm Poets. The Poetry Depot project is now managed by Dave Rock and the InkStorm poets. 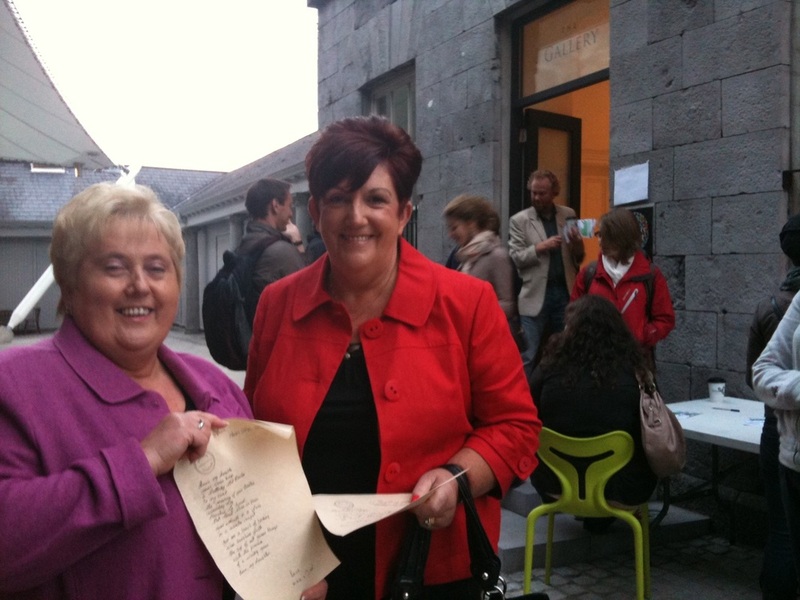 The Poetry Depot has since participated in Irelands premier poetry festival 'Cuirt' and is participating at the Galway, Ocean to Sea Festival 2012. Projects growing independently of our initiation is a measure of the sustainablility of our practice. This is the second project that has thrived beyond our starting point, in fact the Poetry Depot participated in CATDIG version 2011. Now organised by a core group of businesses on Catherine Street, CATDIG itself has had two further iterations since ev+a 2010, with sponsorship from Beamish.